Water, in all its forms, is indeed the crowning glory of the Sierra. The crystalline snows harden beneath the rocky peaks and crests into perpetual snowfields, disclosing here and there beds of blue ice, reminders of the vaster glaciers that ages ago sculptured the cirques and canyons. The cirques now enfold little lakes, sapphire and emerald in hue; sometimes half-frozen, even in summer. Here, in these granite heights, all is silent–silent and undisturbed. But from below comes the tinkling sound of running water; then a murmuring and a splashing as the newborn streams glide into pools irradiated by beams of sunlight. Now comes the great drama of the Sierra. The streams gather volume and begin a boisterous journey, plunging to the depths of canyons in leaping and twisting cascades. In Yosemite, heart of the Sierra, the forms of water attain their most exciting expression. There the great waterfalls leap from lofty cliffs in magnificent variety. In contrast, there are throughout the range hundreds of quiet lakes, lapped in rock basins, bordered by pines and alders. Whether in motion or at rest, the waters of the Sierra are a constant joy to the beholder. Above all, they are the Sierra’s greatest contribution to human welfare. Francis P. Farquhar, the Honorary President of the Sierra Club, died at his home in Berkeley, California on November 21, 1974. Conservationist, mountaineer, scholar and writer, he ranks with John Muir and William Colby in his influence upon the club and the conservation movement. Born on December 31, 1887 in Newton, Massachusetts, graduated from Harvard University in 1901, he came west and discovered Yosemite, the High Sierra, and the Sierra Club. He was transformed by his exposure to John Muir’s Range of Light, and from that moment forward he became a disciple of the Sierra Nevada through his mountaineering, the chronicling of its history, his efforts to preserve it, and his service to the Sierra Club. He served as a director for 27 years, from 1924 to 1951, as vice president and fifth officer, as treasurer, and twice as president from 1933–35 and 1948–49. His writings were prodigious. Besides numerous articles in various magazines and journals, he wrote Place Names of the High Sierra in 1926, edited a new edition of Clarence King’s Mountaineering in the Sierra Nevada, and through his editing of the letters of William H. Brewer, a companion of Clarence King in the California Geological Survey, produced Up and Down California in 1864–64, one of the classics of California literature. His efforts as an historian culminated in his definitive History of the Sierra Nevada. He hiked the length and breadth of the Sierra from Fredonia Pass to Mt. Langley and climbed every 14,000 foot mountain on the West Coast, including the first ascent of Middle Palisade in 1921, the last 14,000 foot peak in California to be climbed. He was responsible, through the person of Robert L. M. Underhill, for introducing the techniques of modern roped climbing to the Sierra, thereby starting the development of a climbing technique that is used throughout the world today. In 1934, he married Marjorie Bridge, an outstanding climber, and for 40 years their home was the center of club mountaineering as climbers of all ages constantly gathered to be reconfirmed in the faith. A pioneer conservationist, he was instrumental in the club’s efforts to get the entire Kern River country added to Sequoia national Park in 1926. In 1965, the club awarded him its John Muir Award for conservation. Francis was a close friend of Stephen T. Mather and Horace M. Albright, cofounders of the National Park Service, and in the 1920’s his San Francisco apartment was the unofficial western headquarters of the National Park Service. 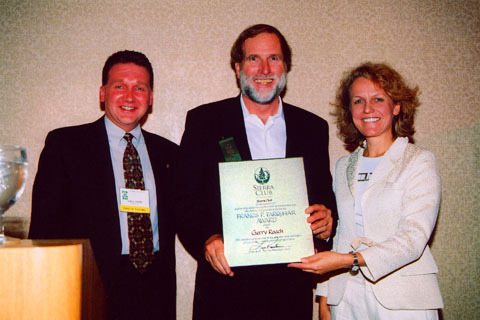 Because of his many contributions to the Sierra Club, it is difficult to appreciate that he carried on a full-time accounting practice as a partner of Farquhar and Heimbucher and that he worked with many other organizations with the same enthusiasm as he did with the Sierra Club. He served as president of the California Academy of Sciences, the California Society of Certified Public Accountants, and the California Historical Society. He received numerous awards and honors, including an honorary degree of Doctor of Humane Letters from the University of California at Los Angeles. Francis Farquhar personified the traditions and principles of the Sierra Club. For over three decades, he inspired, encouraged, and showed the way. Today the Sierra Club reflects the excellence of the example he gave. 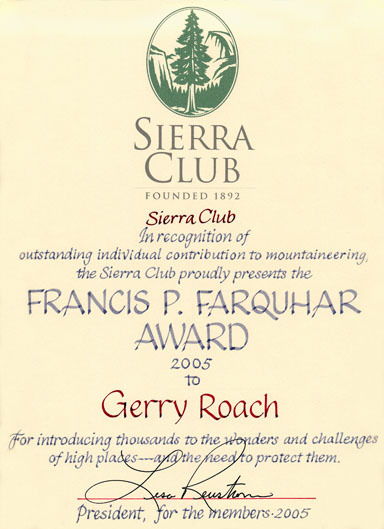 The Sierra Club established the Francis P. Farquhar Mountaineering Award in 1970, while Francis Farquhar was still alive. The award honors an individual’s contribution to mountaineering and enhancement of the Sierra Club’s prestige in this field. The Mountaineering Committee selects recipients, and they do not give the award every year.